Paragaté is a fluid ensemble; its two permanent members are Tim Risher and Tom De Plonty, both of whose names may be familiar to you from the reviews I have written over the past few years, but the ensemble has a number of other creators associated with it, and a history measured in decades. Earlier releases have featured a number of pieces credited to each man, as well as some credited to both of them, and some in which credit is shared with other collaborators. Pattern Of Light is a novelty, inasmuch as all but one of its eleven tracks are credited equally to Risher and De Plonty, the sole exception being the title track, which is Risher’s alone. Whether this represents a shift in their working practices, or a revision of the terms in which they conceive their collaboration, is not clear; but the change is not accompanied by a radical transformation of their sound – they are an experimental music ensemble, so their sound is always changing, and never predictable, but there has been no audible progression to greater coherence, to a more unified creative voice. 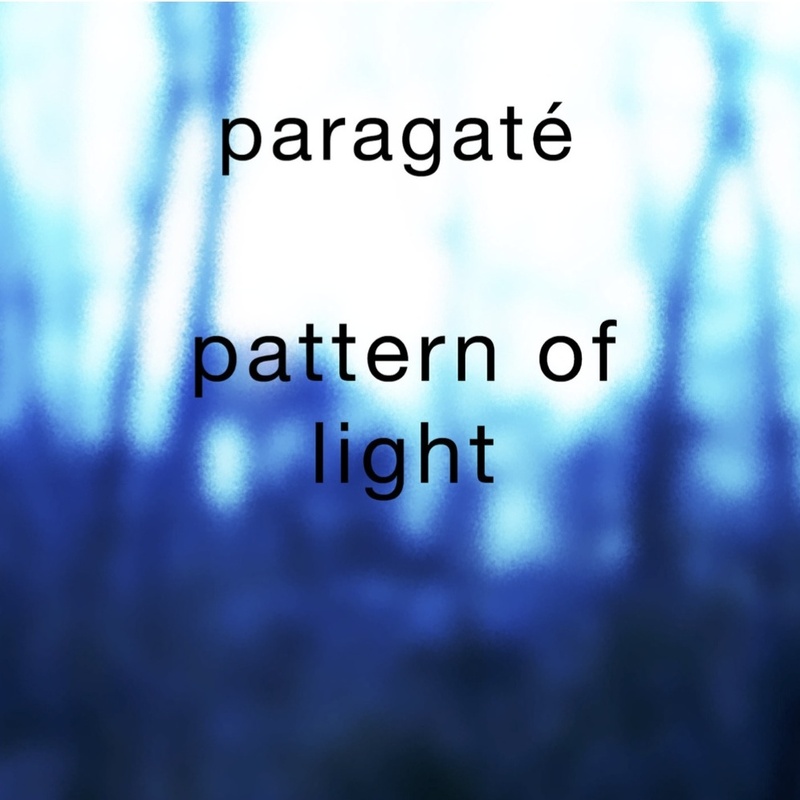 The fact is that Paragaté has always sounded pretty much like itself, not like two (or sometimes more) blokes screwing around with sounds some hundreds of miles apart; Pattern Of Light is an utterance in the same single voice that sounds so lucidly on the previous four albums. That voice’s tenor can be described in terms like ‘ambient’ ‘electronic’ or ‘experimental’, but these words provide only the barest of hints; Paragaté has its feet, I guess, in the mud of the Classical tradition, procedurally at least, but its sounds could have been arrived at from any of a number of experimental perspectives, and the stylistic materials, as always, are drawn from all over the shop, with far more audible references to electronic dance music than to anything else. The basic assumption, I suppose, is that a sound, or a musical device, is a lexical unit, to be assembled according to a logical compositional syntax, irrespective of what its associative value might be. This is not an eclectic album, however (and nor have any of them been), but one in which each sound is purposefully constructed, and the whole informed by a singular sense of creative clarity. For all its conceptual sophistication, Pattern Of Light is primarily addressed to the listening body, with atmospheres that are unproblematically inviting, and rhythms that are symmetrical and direct. It is in many ways less ‘ambient’ than its predecessors, and less ‘difficult’. This is a very coherent sounding album, as sonically and timbrally consistent as it is creatively so. A deliberately circumscribed palette of sounds is employed, and although many of the pieces contain sonic elements that are unique to them, those elements have common characteristics, and there are many recurring themes. The album may be roughly divided, although by no means strictly, into pieces of a more experimental, ambient character, such as ‘Easy Money’ or ‘In The Distance’, and those that might by covered by the rubric of the ludicrous term ‘intelligent dance music’ such as ‘Generation Of The Thoroughly Smug’ or ‘Crash License’. Although Paragaté’s work has always evinced an awareness of popular dance music, it has never been more pronounced than it is here; in fact, pretty much any listener unfamiliar with their oeuvre would be likely to assume that their experimentalism represented a journey away from the dancefloor, rather than towards it. There are pieces here that would be of use to a DJ, albeit they would find a place in a mix, rather than standing alone, as none of them deploy the formulaic narrative of the extended dance tune, with its orgasmic peaks and teasing breakdowns. The harmonic and atmospheric sounds employed, although some are not particularly tonal or soft in and of themselves, tend to promote a gentle, glimmering atmosphere, the sort of lucent soundscape that I associate with dappled sunlight, and I think I’m probably on the right track there, given the title and cover of the album! The rhythmic sounds and basses are similarly consistent, not necessarily in the precise character of the sound, but certainly in the affective impact that they have in context; basses tend to be round, and kicks are solid without being thunderous. Pattern Of Light employs carefully chosen forces, that work together to produce a precisely specified atmosphere. The opening piece, ‘Easy Money’, kicks off with soft, shimmering pads, but they are quickly joined by an insistent percussive element, and the piece develops almost as though it existed in two parallel soundworlds, one ambient and spatial, the other hard-edged and chronic, impelled by narrative. This dialectic, between the rhythmic and the atmospheric, is matched by another, between the rhetorically forceful character of those pieces where every element is working to promote a sense of forward motion, and those which seem more disjointed, more experimental and tentative, seeming to question the certainties of grooves and beats. Frequently this latter dialectic operates within a single piece, becoming effectively another musical parameter, alongside, pitch, timbre and all the rest. This can be heard very clearly in ‘Batteries Not Included’, where the chaotically reproduced vocal sample contrasts with the simple coherence of the non-verbal elements, of in ‘Crash License’, where the driving force of the beat (it’s easily the heaviest track on the album) is constantly battling a sense of suppressed incoherence. ‘But for living there is scarcely any time at all’, with which the album closes, encapsulates both dialectics, using the pulse of a regular kick to resolve the rhythmic detail of apparently experimental procedures into some kind of funky syncopation, but only provisionally, and in a way that emphasises the contingency of all positions on the continuum (if you follow the thought to its logical conclusion). The title of the piece is a quote from John Cage’s 1952 Julliard Lecture, and it is not intended to bemoan the state of the work/life balance (it continues ‘[f]or living takes place each instant and that instant is always changing.’), but to observe the ephemerality of experience, and the illusory status of the sort of compositional rhetoric (i.e. almost all of it) that strings moments together into apparently indissoluble relationships. This might have made a good tag line for the album, had ‘But for living there is hardly any time at all’ been the title track, but ‘Pattern Of Light’ is equally apposite, encapsulating as it does the lambent, hospitable atmospheres of the album, as well as its authors’ concern with the contingent and momentary character of both human experience and musical meaning. The kind of pattern we see on the cover shows the medium of vision with its hard edges removed, its denotational content absent; it shows a form of natural abstraction that in some ways is analogous to the sounds of music, a meaningful pattern that elides the exact circumstance of which it is a trace. Pattern Of Light presents a glittering surface whose formal regularities point to specific creative practices and aesthetic communities, without either directly representing or entirely concealing them. Thought provoking, if you choose to think about it, this is nevertheless an album for sensual enjoyment, a beautiful and intelligent work of art that lives up to the high creative standards already associated with the name Paragaté.